We all have fond memories of dipping our hands into our grandmother’s cookie jar, perhaps by permission but usually when her back was turned. As a child, there is nothing stopping you from indulging on sweet treats – back then we didn’t pay much attention to things like “healthy eating” or “natural ingredients”. As adults it’s hard to walk that fine line between what is good to us and what is good for us. Thankfully, these vegan chocolate chip oatmeal cookies will satisfy those nostalgic cravings without any animals products or animal byproducts. This delicious and crunchy cookie requires no eggs or milk, using bananas as an egg replacement and making it a vegan recipe. These are not your grandmother’s cookies – they contain no white flour, eggs, butter or cow’s milk. This recipe is designed to be as healthy as possible while still retaining that crunchy goodness! 1.25 cups old-fashioned oatmeal, uncooked Preheat oven to 350 degrees. Mix dry ingredients (flour, sugar, salt, cinnamon, baking soda) together in a large bowl. Sift if desired. Mix liquids (canola oil, applesauce, “milk”) together until blended. Pour liquids into flour mixture and blend well. Mix oatmeal, raisins, chocolate chips together then add to flour-liquid mixture. Stir until no dry parts remain. Spoon batter by flattened tablespoon onto greased cookie sheet. Leave about 1/2 inch between cookies. Bake 10 to 12 minutes. Tops and bottoms will be slightly browned. 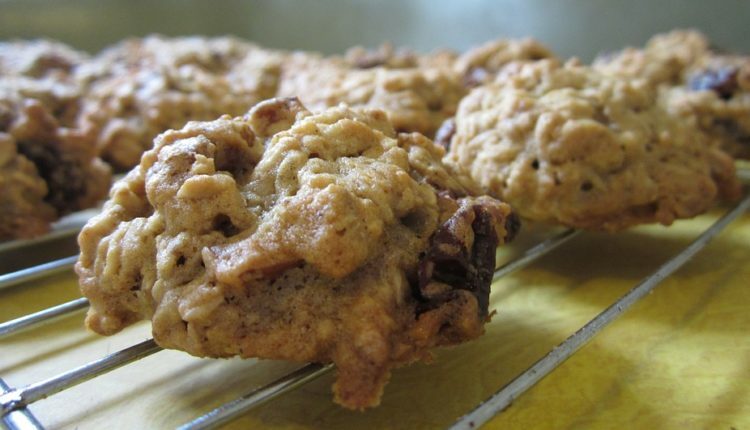 You can take these vegan chocolate chip oatmeal cookies to the next level by adding 1/3 cup of pecans, walnuts or peanuts. These cookies freeze extremely well, so place any extras in a zipper-lock bag. The dough itself does not keep well, so bake them up as soon as your ingredients are mixed.